The Kennedy Mine is open every Saturday, Sunday and Holiday from 10 AM to 3 PM, March through October. FREE Admission. Guided tours are: $10.00 for ages 13 to adult, $6.00 for youngsters 6 through 12, and free to those under 6. Group Guided tours are available, by reservation, all year. Guided Tours are recommended for an interesting, in-depth, and educational tour of the grounds [about 1.5 hours]. You may, if you wish, purchase a self-guided tour book in our gift shop and wander on your own. Some prefer to bring a picnic lunch and just soak in the ambiance of this historic spot. Plan a Kennedy Mine Tour now! Celebrated 13 days after Dec. 25th...for over 100 years our Serbian-American population has marked this day with a volley of rifle shots to announce that Christ is born in front of the National Hotel, St. Sava's Church on North Main St., and St. Sava's Mission on Broadway. Know that you are safe and all is well as the rifles are not loaded with live rounds. It's your neighbor celebrating and keeping alive the rich traditions of the old country, and wishing you every happiness this Holiday Season, with great prosperity and good health in the New Year. Downtown Jackson becomes an outdoor bazaar and flea market featuring antiques, relics and collectibles, arts and crafts, food, street entertainers and a 5K run. NEW THIS YEAR: Special Yard sale Section! Free Shuttle Bus service to free parking at the corner of So Hwy 49 and Broadway and the new County Admin building. An authentic wagon train of sixteen horse-drawn wagons will pull into Jackson after a four-day journey through Amador County, with stops at Howard Park (Ione), the Amador County Fairgrounds (Plymouth), Italian Picnic Grounds (Sutter Creek) and Laughton Ranch (Jackson). Bring the whole family to Main Street, Jackson for a Wagon Train Parade on Sunday. Enjoy music, Gold Rush-era activities, BBQ, family fun and Barn Dance at Laughton Ranch, 90 Clinton Rd, Jackson, 95642. Click here for full schedule (link to press release). Details and schedule at www.VisitAmador.com or call Amador Council of Tourism, 209-267-9249. All events free. See the full schedule HERE. Third Saturday in May - In Historic Downtown Jackson, California on Main Street. Rocks, Slabs, Hand Crafted jewelry, Beads, Gemstones and other hand crafted items. 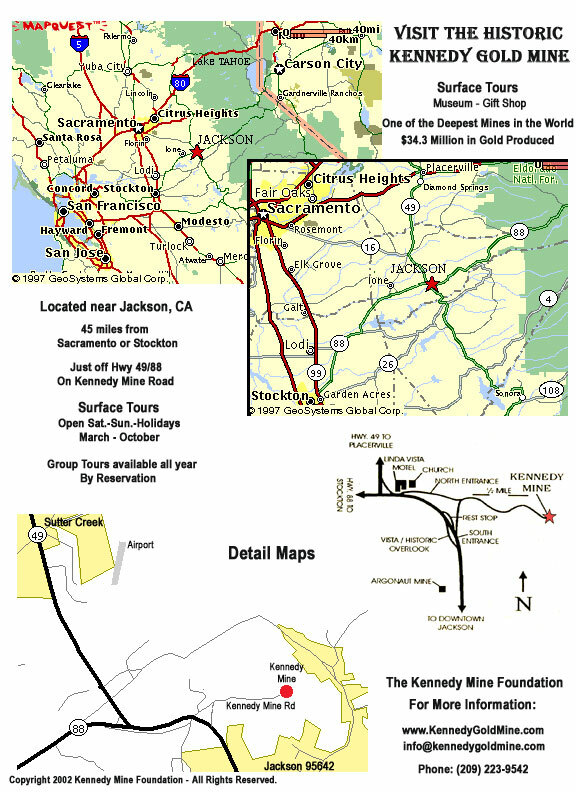 FREE admission, Tour of Historic Kennedy Mine for a small fee. Annual celebration of our nation's birthday, sponsored by the Jackson Lion's Club. The event takes place on the 3rd of July each year and is held at the Jackson Junior High School field. Presented by the Jackson Business and Community Assn..every year on October 31st. A kids parade down Main Street presented by the Jackson Lion's Club annually on October 31st. JOIN THE VETERAN"S DAY PARADE! Be sure to sign up and join the American Legion Post 108 Veteran's Day Parade, November 11, 10 am on Main Street Jackson. More information: Charline Buckley, 296-4438. Watch for more information. Plaid Friday - Skip black Friday this year and join us in downtown Jackson for Plaid Friday. Friday and Saturday after Thanksgiving Day, 6 - 9 pm. Santa will light the town Christmas Tree, 6 pm Friday and Saturday at the Firehouse, then join Santa for photos at the National Hotel. Mrs. Santa Claus reads to little ones at Hein & Co. Bookstore on Friday. Enjoy the sights and sounds of the season while strolling Main Street -- free horse-drawn carriage rides, live music, activities for kids and treats for all at the downtown merchants.